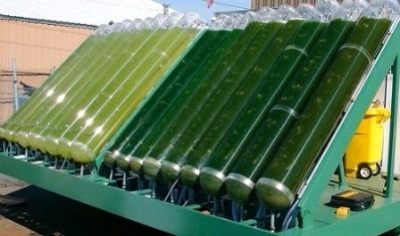 Algae Biofuel — No Longer the Next Big Thing? In yesterday’s Greenwire (subscription required), reporter Paul Voosen reviews of the efforts of various firms to develop commercially competitive motor fuel from two types of single-celled photosynthetic bugs — algae and cyanobacteria. For several years, biofuel entrepreneurs and alt-energy gurus touted oil extracted from algae as the next big thing — abundant, cheap, home grown, hi-tech, carbon neutral. In addition, unlike corn-ethanol production, growing algae in ponds or bioreactors would not inflate grain prices or divert food from hungry mouths into gasoline tanks. Often ignorant of algae’s biology, these companies stumbled into major physical and engineering hurdles that can derail most of their lofty goals, industry and government experts say. Even the most promising approaches are a decade or more away, experts say. By then, many firms will have failed. Most of these problems were predicted — and ignored. Algae are speedy growers, but they are also greedy, preventing sunlight from penetrating even moderately dense concentrations. The most popular algae varieties, which resemble single-celled plants, remain difficult to bioengineer. Water requirements are vast. And while pond scum are prolific in building up oily fats, they surrender their dearly built energy stores only if they are killed and broken apart. For every gallon of oil made from algae in a pond, hundreds of gallons of water need to be circulated, he said. The algae cannot grow in dense concentrations, because they do an excellent job of blocking sunlight, even when they don’t use it for energy, instead wasting it as heat. Voosen titles his column “As algae bloom fades, photosynthesis hopes still shine,” because companies like Joule Unlimited are developing biofuel from cyanobacteria, which are easier than algae to decode and modify genetically. Also, production does not require breaking apart the cells to extract oil, as in the case of algae, because the cyanobacteria excrete ethanol. What irks Joule’s competitors and scientific peers is that the company remains vague in backing up its claims, even in its patent applications. No hard economic or production rates have been released — not an uncommon trait for a private firm — and even theoretical papers assessing the cost of industrial photosynthesis, including one recently published in Photosynthesis Research, provide little to the technically inclined reader.